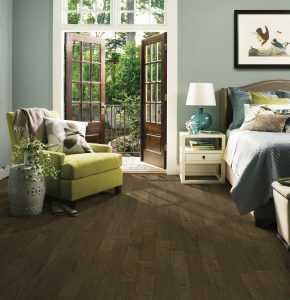 This is the most common question people ask when it comes to selecting new wood floors. It’s simple, solid hardwood consists of one piece of wood, whereas engineered wood is constructed of multiple layers of fiberboard sandwiched between a hardwood backing and finished with a wood veneer. Upon hearing this difference, many homeowners are reluctant to install engineered wood flooring in their homes believing it’s not real wood. Although, thinner than solid hardwood, the top layer of an engineered product and solid hardwood are the same, and after the floors are installed, visually, it is nearly impossible to tell the difference between the two. With our ever-changing Indiana weather – high humidity in the summer and dry air in the winter – engineered flooring is proven to be more stable due to the multiple layers of fiberboard that make up its interior. This minimizes the amount of expansion and contraction between planks and helps prevents gaps and buckling of the boards as the seasons change. In other words, engineered flooring isn’t as prone to moisture problems as solid hardwood faces. Being that engineered flooring is very stable, longer and wider planks can be used (and are quite popular nowadays too). Lengths as long as 84 inches with widths 12 inches or more allow for a unique look when installing these floors throughout the entire home. Typically, if homeowners are interested in 5-plus inch wide planks, it is highly recommended to install an engineered wood, especially since it also comes in more variations than solid hardwood flooring, making your options nearly endless. Solid hardwood floors require a glue-down, nail down or staple installation atop a wood subfloor. Although, most engineered floors can also be glued, nailed or stapled, they are also installed as “floating floors”– meaning they interlock with one another to create a floor that essentially floats above the subfloor. Since they can float, most engineered floors can be installed on a concrete slab subfloor and even below grade, which makes them a great design solution for basement flooring in your home. To learn more about flooring options for your next project, set up a meeting with one of the designers at ACo by visiting them online at liveaco.com or calling 317-575-9540.